Our 2014 Conference attracted nearly 400 in Lowell and was full in advance. Experts and learners from 9 states, 30 nonprofits, 40 colleges, 45 companies, and 95 communities attended. Focused Sustainability and Vertal US Inc. 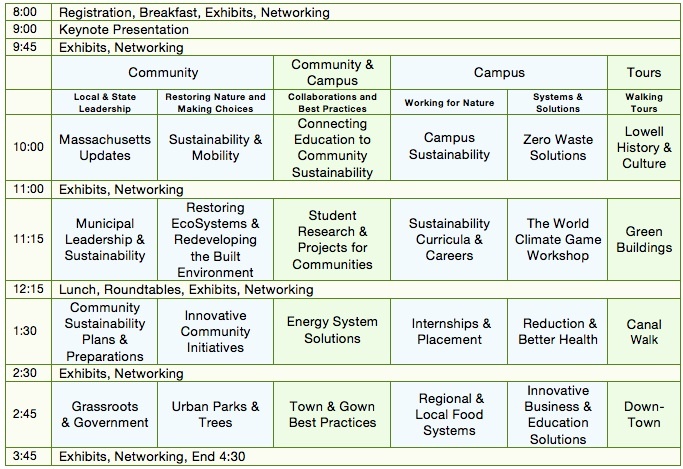 The annual Sustainable Communities and Campuses Conference connects stakeholders from municipalities, college campuses, government, businesses and nonprofits. Everyone wanting to learn more about best practices, current trends, and resources will find this conference timely, practical and valuable. In 2014 the two conferences are held same day and location in Lowell. Reachable by public transportation. Info at Sustainable Transportation and Bicycling and Walking Map. Benefit from advance registration: $60. Registration after March 20 is $75. Students are $45. Groups of 5 or more, $5 discount. Walk-ins if available, $90. This registration fee covers keynote presentation, breakout sessions, exhibitors, lunch, breakfast, roundtable discussions, and FREE book raffle. Advance registration is recommended as previous conferences have filled. An advisory team of professionals representing communities, education, business, government and nonprofits; and an on-site conference team helped with this conference which was created and hosted by Green Workforce Training. Click on presenter’s name to view PowerPoint presentations. Panel Presentation: Leaders share achievements & plans to advance sustainable development in the community & on campus. Learn about MA Global Warming Solutions, Green Communities updates, emerging trends, & resources. Choices for modes of travel are expanding to meet local interests on campuses & in communities. Existing & emerging initiatives connect education and community sustainability. Sustainability professionals tell the story of change & progress on their campuses. Reducing waste to zero is a challenge that many advocates, businesses, campuses & communities are striving to achieve. Join a Lowell writer & historian for a walk. Hear how the ‘cradle of the American Industrial Revolution’ has become a world-class model of urban revitalization. City leaders are championing a variety of sustainability initiatives in their communities. Visionaries are finding better ways to repair & build with healthy ecosystems in mind. Students are championing important sustainability work in Massachusetts. New, interdisciplinary & cross-curricular educational options offer novel career opportunities. Take on the role of a delegate to the United Nations climate conference in a facilitated roleplaying game framed by the best available climate science. No prior experience necessary – but come ready to make a decision that will affect generations to come. See two examples of successful urban green buildings: a platinum LEED building & a green roof. Reclaiming derelict & forgotten structures & re-integrating them sensitively into the urban fabric of cities like Lowell conserves both materials & energy, & in the process preserves history. Each community, from urban to rural, is approaching local issues in its own way. Hear about a city sustainability master plan, a climate preparedness report, & a small town’s achievements & plans. Two communities are coming up with a variety of creative solutions & each has success stories to share. Hear an overview of renewable energy solutions & cutting edge solar initiatives. Workforce & sustainable development go hand in hand. Students gain valuable experience in the field while offering valuable knowledge & skill. Designing toxics out of products & out of our lives is an important step to better health. Walk along the canal which forms part of the Lowell National Historical Park. Public support & government leadership for higher environmental standards can create tremendous results. Hear from those at the forefront of this drive. Organic landscapes & reforestation are vital to health and sustainability, even in our towns & cities. 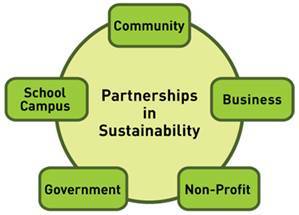 Learn about sustainability connections between communities and campuses. Caring for the earth is a the primary mission for eco-minded entrepreneurs & they are forging ahead with creative practices. Join a Lowell historian for a walk through downtown Lowell. Learn about the people, culture, history, politics & sustainability that make the city a revitalized success today.